Polish physician; born 1808 at Tarnogrod, Lublin; died 1889. His father was district physician of Zamoisk and on the staff of the Polish army. David studied medicine at Vienna, and in 1831 was sent to Hungary and Transylvania, where the cholera was raging. 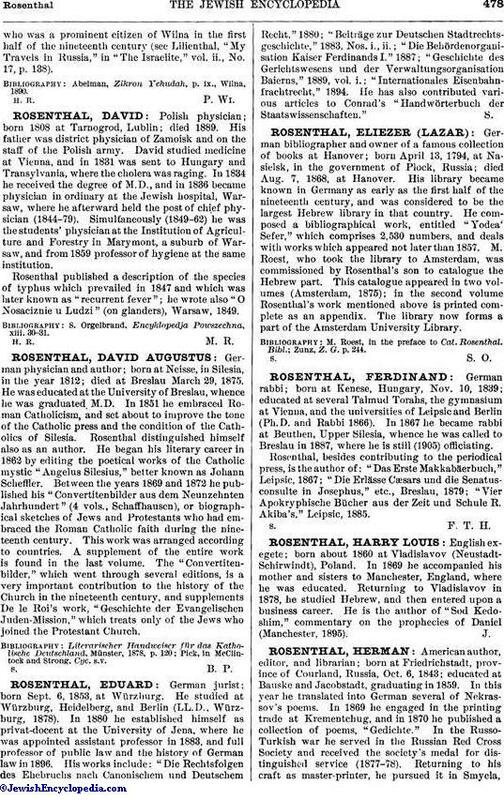 In 1834 he received the degree of M.D., and in 1836 became physician in ordinary at the Jewish hospital, Warsaw, where he afterward held the post of chief physician (1844-79). Simultaneously (1849-62) he was the students' physician at the Institution of Agriculture and Forestry in Marymont, a suburb of Warsaw, and from 1859 professor of hygiene at the same institution. Rosenthal published a description of the species of typhus which prevailed in 1847 and which was later known as "recurrent fever"; he wrote also "O Nosaciznie u Ludzi" (on glanders), Warsaw, 1849. S. Orgelbrand, Encyklopedja Powszechna, xiii. 30-31.